This was one of those sobering posts that comes across from my Facebook friends that have closer connections to the racing world than I do. I'm assuming that everyone reading this post knows what Group B rallying is. If not, just search YouTube and you'll come across an era of madness and awesomeness that is unlikely to ever be rivaled in racing again. The downfall? Danger. Racing is inherently dangerous, everyone should know that, but Group B is set apart from this because it ended up being so far beyond the normal level of danger for both the crews and the spectators. 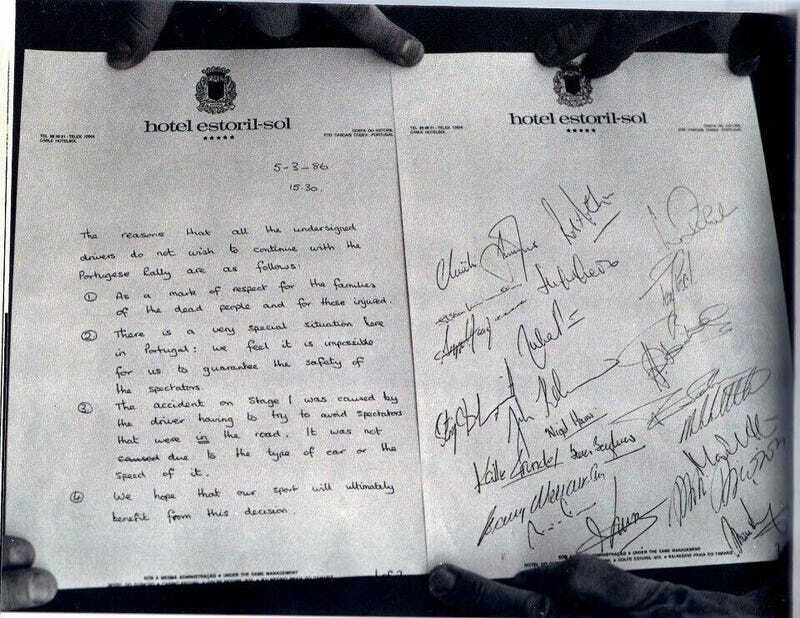 The letter above stemmed from one of the most tragic incidents in rallying history, obviously, at Rally Portugal. In 1986, A Ford RS200 crashed into a group of spectators killing several and injuring many more. It was becoming clear that the sport was too dangerous and, among other changes, the Group B class was dropped from rallying. The cars and the era will live on forever in our hearts but the price was too high and it came to an abrupt end.